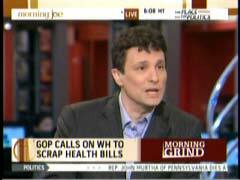 On Tuesday's Morning Joe on MSNBC, on the same show in which host Joe Scarborough had earlier complained about FNC's Bill Sammon claiming that the media "hate" Sarah Palin, guest David Remnick of the New Yorker magazine - formerly of the Washington Post - declared that "Sarah Palin's entire career would be eliminated" if Americans were influenced by seeing "preposterousness" on public display. Remnick's comment came during a discussion of the Senate's adherence to the filibuster rule that makes it easier for the minority party to block the passage of legislation. At about 8:09 a.m., Scarborough contended that he would prefer that filibuster participants be required to actually stand up and speak in televised debate so that Americans might see the "preposterousness" of the practice. Remnick then took his shot at Palin to dismiss Scarborough's theory that "preposterousness" could wake up the American public. Remnick: "We see a lot of preposterous things in American politics. That doesn't seem to convince us otherwise. Sarah Palin's entire career would be eliminated, would pass out of history if preposterousness were somehow disqualifying, but it's not." DAVID REMNICK, THE NEW YORKER: We see a lot of preposterous things in American politics. That doesn't seem to convince us otherwise. Sarah Palin's entire career would be eliminated, would pass out of history if preposterousness were somehow disqualifying, but it's not.